The Mousehole Pottery and Gift Shop was established by Bill and Biddy Picard in 1955 and continued until 1961. All pots produced were earthenware. Born in Derbyshire in 1922, Biddy Picard studied at Chesterfield Art School and the Slade, before moving to West Cornwall with Bill. Biddy is a well established artist as is her son Peter Perry. Bill Picard worked as a decorator at Lamorna Pottery and for a while with Jess Val Baker at the Mask Pottery. 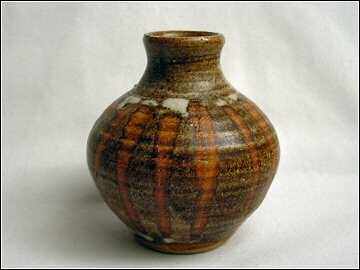 He trained with Bernard Leach and later taught ceramics at the Penzance School of Art for a number of years although he had never thrown a pot. Greta Perry (Biddy Picard’s daughter) restarted the pottery from different premises in Brook Street in 1978 and ran it until 1989. Greta had previously attended the Penzance School of Art and worked at the Mask Pottery. Greta’s pots were exclusively stoneware.